Jennifer Aniston wedding at a California winery this weekend? I've heard this twice already today from different sources. If the above is true,I wish her and Justin a lifetime of happiness! 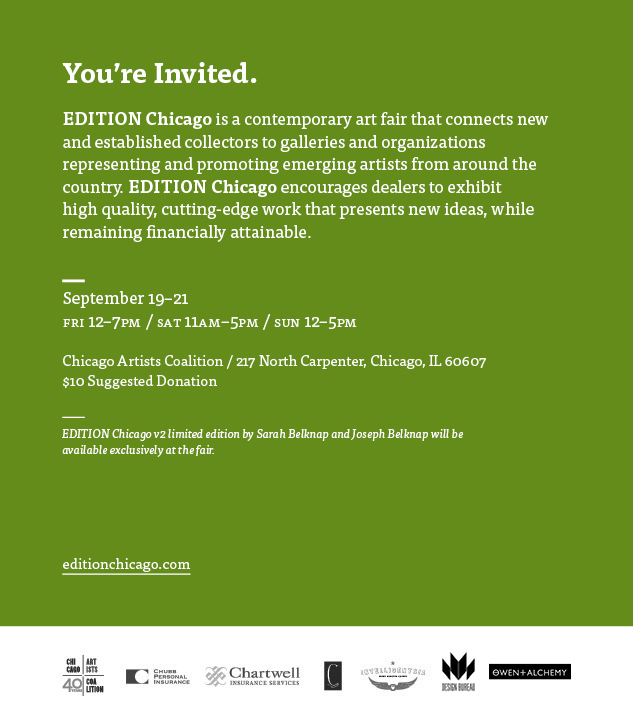 Join us at EDITION Chicago September 19–21. Free. Suggested $10 donation to CAC. 2012-2013 BOLT Residents Sarah Belknap and Joseph Belknap will create 25 special-edition archival silicone wall sculptures, entitled “Fossil Fields,” that will be available for purchase exclusively at EDITION Chicago. Editions are $100 each. 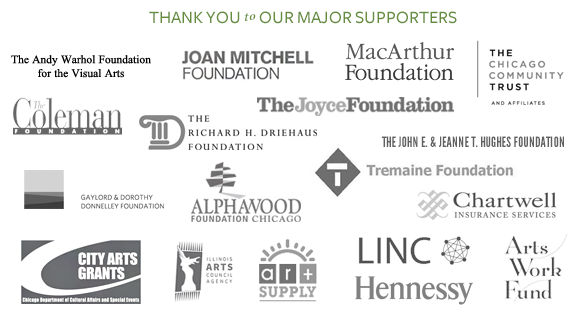 The Belknaps' work will be on view at the Museum of Contemporary Art Chicago in “BMO Harris Bank Chicago Works: Sarah and Joseph Belknap,” from October 11, 2014 – February 24, 2015.
and Chubb Personal Insurance, and is sponsored by Intelligentsia Coffee and The Conservation Center. The official media sponsor of the 2014 fair is Design Bureau. (Chicago, IL)- Chicago author, Maureen Stolar Kanefield, has a brand new book coming out and The Red Balloon Co. is ready to give you a sneak peek. On Saturday, September 20th beginning at 2pm, young writers, avid writers, and everyone in-between is invited to the store's Hyde Park location for food, beverages, and of course a reading from Maureen's new book titled The Magic of Maxwell and His Tail. And don't forget to bring a pen because the author will be signing copies of her book for fans young and old! Chicago entrepreneur, consultant and event producer April Francis has finalized the roster for this September's DOSE MARKET and the lineup includes some of Chicago's most talented and promising chefs, artists and designers. 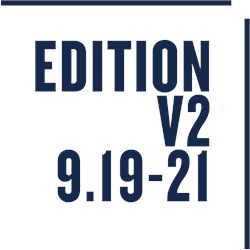 After six successful seasons and thirty-five Doses, location changes and an inspired organic evolution, DOSE MARKET will make its 2014 debut on September 21st at Morgan Manufacturing (401 N. Morgan St.) from 10 a.m. to 5 p.m. Dedicated to curating enviable goods for the urbanite connoisseur while maintaining a strong commitment to spotlighting emerging talent, DOSE MARKET's carefully selected list of vendors allow it to serve as an engine to promote new businesses while giving Chicagoans a dense place to shop, see and talk. "We believe people are hungry for excellence and that is why this community has thrived," said Dose Market owner April Francis. "Those who dedicate themselves to doing great things deserve a platform designed to champion their work. I look forward to showcasing the Dosers this season in the new space (Morgan Manufacturing) and on dosemarket.com." September's market, the Dose Bomb, showcases new Dosers like Mac & Mia, Another 20, Celeste, Owen + Alchemy, The Stylisted, THE IDLE.WILD, Rooted and more. Evergreen Dosers such as Stock Mfg. Co., La Sirena Clandestina, Saffron Vintage, Lille Huset, Field & Florist, Burton's Maplewood Farm and Poems While You Wait return. Showcasing a total of 88 Dosers in the dynamic Morgan Manufacturing space along with a special performance by White Mystery and the A/V excellence of We Theory, Link to the full lineup below. COST: $8 online or $10 at the door. Both include free drink tickets for the 21+ crowd. Dose Market is an ever-dynamic marketplace devoted to showcasing the finest designers, chefs, makers, bakers, entrepreneurs and artists. To the delight of shoppers in Chicagoland and beyond, for the past four years Dose has worked tirelessly to discover and develop a community dedicated to excellence and delight. Celebrating the food, fashion and art of those committed to these passionate pursuits, there's no better way to spend a Sunday. Please join us! There's always a fresh Dose. April Francis, a stylist and identity and communications specialist with global reach, has dipped her toes in a number of industries but DOSE MARKET has given her the greatest success and satisfaction. Founder of The Haute Closet, she was propelled into notoriety after being featured in publications such as The New York Times, Refinery29, The Wall Street Journal and many more. An entrepreneur from a young age, Francis has served as an adjunct professor at Columbia College and consulted for some of the world's leading hotels as a developer of luxury spa concepts. NanHai Art is pleased to present Contemporary Ink..., a group exhibition of contemporary Chinese ink painting featuring 16 new works by Li Huayi, Wang Tiande, Zheng Chongbin, and Lu Chuntao, curated by Kuiyi Shen, Professor of Asian Art History and Director of the Chinese Studies Program at UC San Diego. NanHai Art (520 Broadway, Millbrae, CA 94030) will host an Artists’ Talk on October 4th at 2pm with curator Kuiyi Shen and artists Zheng Chongbin and Lu Chuntao discussing contemporary ink painting in the upstairs lecture hall, followed by an opening reception beginning at 3pm in the main exhibition hall. Contemporary Ink will present four artists whose distinctive styles represent a contemporary impetus in the practice of ink art. Regarded in China as one of the forms of “high art,” ink painting has maintained its presence over the years in large part due to the technical discipline of artists and art schools that focused on maintaining traditional skills, with a scholarly emphasis on mastery of the medium. However, in the later twentieth and dawn of the twenty-first century, a new generation of artists intrigued by working in a medium with such long-standing cultural significance has reinvigorated the form through an innovative appropriation of concepts and styles, producing works rooted in the tradition, but fully representational of the contemporary experience. Li Huayi, a San Francisco-based painter born in Shanghai, where he studied ink painting before moving to California and completing an MFA at the Academy of Art, is a prominent proponent of the genre today. His paintings evoke the monumental style of the Song dynasty, landscapes of extremely complex brushwork and attention to natural detail, but his fragmentation of the composition results in compelling otherworldly images. While the untrained eye might easily confuse the artist’s hand with that of a classical master, Li Huayi’s process of painting is actually quite Western in that he begins each piece by blocking out the major compositional elements in wash. Pulling from influences as diverse as the masters of the Chinese monumental landscape and American Modernist movements, Li’s work is remarkable in its responsiveness to the iconoclasm of contemporary painting, while also retaining the intricacy and refinement of ancient Chinese painting. The exhibition’s other locally based artist, Zheng Chongbin, also studied traditional ink painting in China before receiving an MFA from the San Francisco Art Institute. Already a member of the avant-garde movement in China before moving to the US, Zheng works in various mediums, including sculpture and installation. His sensitivity to space is evident in his ink painting, where he employs white acrylic paint and ink, making bold use of negative space to suggest registers of depth. In some cases the artist layers his densely applied ink until it returns to a state similar to that of smooth, shiny coal. In others, the irregular interactions of black ink and white acrylic paint powerfully suggest the forms of crystallizing ice or wintry trees. Zheng’s rejection of the traditional techniques in which he was schooled ultimately enables him to discover new connections between humanity and nature. Another master manipulator of materials is Wang Tiande, a Shanghai-based artist and professor at Fudan University. Well known for his “Digital” series, Wang burns parts of the xuan paper used in ink painting with the tips of lit incense sticks. He then layers this landscape of smoke-steeped paper and charred linework over another image, painted in ink, and inspired by literati art of the Yuan or Ming dynasties. His newest works also incorporate ink rubbings of antique stone steles from East Mountain in Suzhou, traces of past commemorative texts and eroded masterpieces of calligraphy. Wang’s technique of loosely overlapping the two sheets of paper creates an illusion of spatial depth and a hazy effect that conveys an uncertain temporality. Like many post-modern artists, Wang’s assemblage approach to painting builds on complex theories about the role and evolution of painting, and of the nature of the medium itself. Lastly, Lu Chuntao, the youngest of the four artists, who is also based in Shanghai, will present new works in his series of depictions of the lotus pond, a favorite symbolic element in Chinese art, and a representation of purity and transcendence. Lu’s abstracted works in starkly contrasting light and dark hues eschew metaphor for a more nuanced approach to the subject in tune with the color field painters or expressionists. These artists’ work has already become an important component in the process of constructing contemporary Chinese culture. It stands as a symbol of Chinese cultural identity, but is not to be simply confined within the bounds of traditional culture. Rather, it is clearly affected both in concept and attitude by contemporary society. As with other forms of Chinese art today, it expresses the contemporary spirit of society and culture. Kuiyi Shen is Professor of Art History in the Department of Visual Arts and Director of the Program in Chinese Studies at the University of California, San Diego. His current research focuses on modern and contemporary Chinese art and Sino-Japanese cultural exchange of the early twentieth century. His publications include A Century in Crisis (Guggenheim Museum, New York, 1998), Between the Thunder and the Rain (Asian Art Museum, San Francisco, 2000), The Elegant Gathering (Asian Art Museum, San Francisco, 2006), Chinese Posters (Prestel, Munich, 2009), Blooming in the Shadows (China Institute, New York, 2011), The Art of Modern China (University of California Press, 2012), which was awarded the 2013 Book Prize in Humanities by the International Convention of Asia Scholars, and Light before Dawn (Asia Society, Hong Kong, 2013). He is a recipient of fellowships and awards from the National Endowment for the Arts, Social Science Research Council, Japan Society for the Promotion of Science, Stanford University, and Leiden University. Li Huayi was born in 1948 in Shanghai and studied painting with Wang Jimei and Zhang Chongren. He moved to San Francisco in 1982, where he received his M.F.A. at the Academy of Art. Li Huayi’s works are in the collections of the Arthur M. Sackler Museum, Harvard University, Cambridge; the Tokyo National Museum, Tokyo; the Asian Art Museum of San Francisco; the Museum of Fine Arts, Boston; the Princeton University Art Museum, Princeton; the Peabody Essex Museum, Salem; the Guggenheim Museum, New York; the Cleveland Museum of Art, Cleveland; the Art Institute of Chicago, Chicago; the Spencer Museum of Art, University of Kansas, Lawrence; the Fung Ping Shan Museum, Hong Kong; as well as numerous major private collections. He has had solo and group exhibitions throughout the world, including at the Asian Art Museum of San Francisco; Arthur M. Sackler Museum, Harvard University, Cambridge; the Princeton University Art Museum, Princeton; College of Wooster Art Museum, Wooster; Museum of Fine Arts, Boston; and National Art Museum of China, Beijing. Wang Tiande was born in Shanghai in 1960 and graduated from the Zhejiang Academy of Fine Arts (now China Academy of Art) in 1988. He is now a professor of art at the Fudan University in Shanghai. Wang Tiande’s works are in the collections of the Shanghai Art Museum, Shanghai; Shenzhen Art Museum, Shenzhen; the Guangdong Art Museum, Guangdong; the Hong Kong Museum of Art, Hong Kong; the Museum of Fine Arts, Boston; and the Metropolitan Museum of Art, New York, as well as major private collections in Asia and the West. He has had solo and group exhibitions at the British Museum, London; the Montreal Museum of Fine Art, Montreal; the Louisiana Museum of Modern Art, Humlebæk; the Staatliche Kunstsammlungen, Dresden; the Shanghai Art Museum, Shanghai; the National Art Museum of China, Beijing; the Today Art Museum, Beijing; the Hong Kong Museum of Art, Hong Kong; and the Metropolitan Museum of Art, New York. Zheng Chongbin was born in Shanghai in 1961. In 1977 he began his formal training at the Culture Palace of Shanghai for talented teenagers and later studied with the artists Mu Yilin and Chen Jialing. He graduated from the Zhejiang Academy of Fine Arts (now China Academy of Art) in Hangzhou in 1984 and taught painting there until 1988 when he moved to the United States to attend the San Francisco Academy of Art. He received an M.F.A from the San Francisco Art Institute in 1991. Zheng Chongbin’s works are in the collections of the British Museum, London; the Asian Art Museum of San Francisco; Marina Bay Sands, Singapore; Daimler Art Collection, Germany; and the DSL Collection, France. He has had solo and group exhibitions at the Hong Kong Arts Center, Hong Kong; Shanghai Art Museum, Shanghai; Palazzo Mora, Venice Biennale, Italy; University of Alberta Museum, Alberta, Canada; Taipei 2010 Contemporary Ink Painting Biennial, Taiwan; the Asian Art Museum of San Francisco; Asia Pacific Art Museum, Pasadena; Pusan Museum of Modern Art, Pusan, South Korea; the Third Chengdu Biennale, Chengdu; and the National Art Museum of China, Beijing. Lu Chuntao was born in Chongming Island, Shanghai, in 1965 and studied art at Shanghai International Studies University from 1984 to 1986. He is currently vice principal of the Shanghai Calligraphy and Painting Institute, visiting painter at Shanghai Chinese Painting Academy, and a member of the China Artists Association and the board of directors of the Shanghai Artists Association. Lu Chuntao has had solo and group exhibitions at Casares Museum, Italy; Museum of Contemporary Art, Singapore; Taipei World Trade Center, Taiwan; Busan Exhibition and Convention Center, Busan, South Korea; National Agriculture Exhibition Center, Beijing; Art Museum of Shanghai Chinese Painting Academy, Shanghai; Shenzhen Museum, Shenzhen; RNHR Tower, Cologne; Mannheim Museum, Mannheim; and the National Art Museum of China, Beijing. He has been invited to exhibit at many contemporary ink exhibitions worldwide including the 7th Shenzhen International Ink Art Biennale, Shenzhen. Founded in San Francisco in 1986, NanHai Art is presently located in Millbrae, California, providing easy access for the Greater Bay Area art community. NanHai Art focuses on introducing major artworks by contemporary Chinese artists that reflect the unique aesthetics of Chinese art while transcending cultural and artistic boundaries with a contemporary sensibility. Visit www.nanhaiart.com for more information. NanHai Art is a 5 min. walk from the Millbrae BART and Caltrain stations, for drivers take the Millbrae Ave. exit on US-101. Tuesday-Saturday, 10 AM-5 PM, and by appointment. Copyright © 2014 A & O PR, All rights reserved.